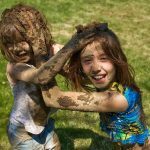 Many parents remember spending their childhood playing outside; riding their bike, running around in the garden, rolling around in the grass and mud – being one with nature. Nowadays most of play time has moved indoors and children spend most of their time in front of an electronic screen. It’s time to make a change and get children outdoors more! Running, jumping, skipping, climbing, swimming and more, all increase fitness levels and physical development in children. Playing actively increases flexibility, balance and coordination, and fine and gross motor skills. Spending time in the sunshine and fresh air will not only increase a child’s mood and energy, it will improve Vitamin D levels which strengthen bones and protect them from health conditions such as heart disease, obesity and diabetes. Also, by being exposed to grass, dirt, animals, bacteria’s etc., children will build up their immune system, better protecting them against allergies and deficiencies. Playing outdoors contributes hugely to learning. Young children learn predominately through their senses. Playing outside provides many things for them to see, touch, smell, hear and to taste. Outdoor play also stimulates the imagination! Children are more likely to invent games and interact more with adults and each other therefore also less likely to engage in bullying. In the playground, children learn to communicate and collaborate, thus developing their social and emotional skills like sharing and expressing their feelings. Among all this, children will learn to appreciate and respect nature! For fun ideas of things to do with your children outside click here. This entry was posted on April 13, 2017 by Angelique Cocco.